The only exhibition South Korea exclusively dedicated to personal care Ingredients. the innovative products from across Asia and the rest of the world. It is the world biggest exhibition for cosmetics ingredients and technical production. The exhibition is the Chinese largest event dedicated to cosmetics ingredients and innovations. 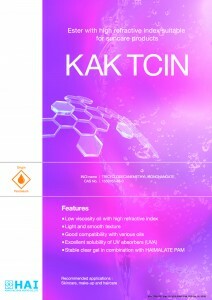 We launched a new product, “KAK TCIN” at CITE Japan 2015. Excellent solubility of UV absorbers (UVA). Low viscosity oil with high refractive index and light smooth texture.